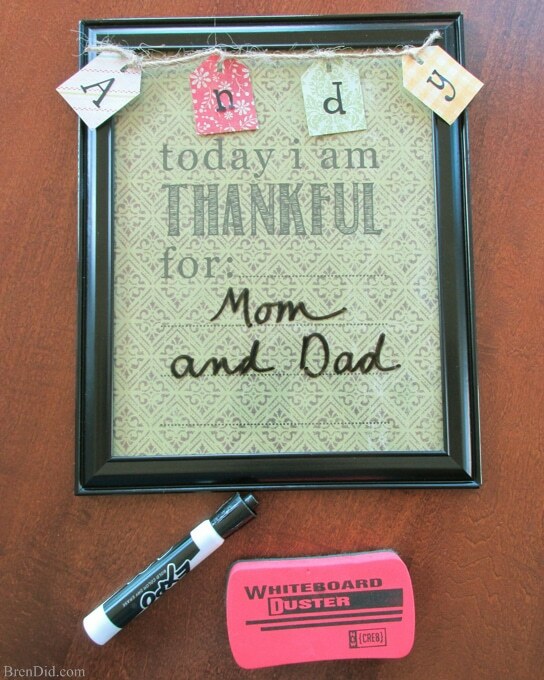 This adorable I Am Thankful dry erase board (with free printable) is an easy Thanksgiving crafts that you can make with your kids to reinforce grateful behaviors and emphasize thankfulness this holiday season. 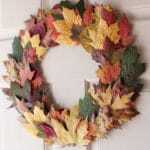 Add them to your list of easy Thanksgiving decorating ideas! 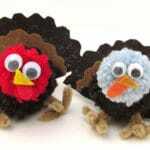 Thanksgiving is approaching fast and Christmas is just around the corner. This (unfortunately) means the barrage of captivating tv advertisements, colorful toy catalogs in the mail, and tempting displays at stores aimed at kids is in full force. It’s easy, in this season of giving, for children to turn into whining, greedy little creatures. My husband affectionately calls our kids “Me First and the Gimme Gimmes” when they trade their normally lovable dispositions for ones that are demanding and/or unkind, as though they were a sweet 1960s girl group instead of self-centered beings focused solely on toy-list making. What’s a parent to do? According to Slate Magazine and Educating Today, gratitude is a learned behavior. If we want our children to be content we need to teach them gratitude. Of course, it sounds intuitive: adults should teach their children gratitude and model good behavior, but this might be easier said than done. As busy families, we probably take time to teach our kids to say please and thank you and make them help around the house — but how often do we take the time to discuss and reflect on our blessing in life and how grateful we are for the people and things in it… especially in front of our children? 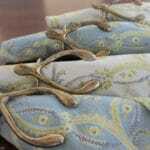 Parents Magazine believes rituals can reinforce the grateful behaviors parents’ desire. 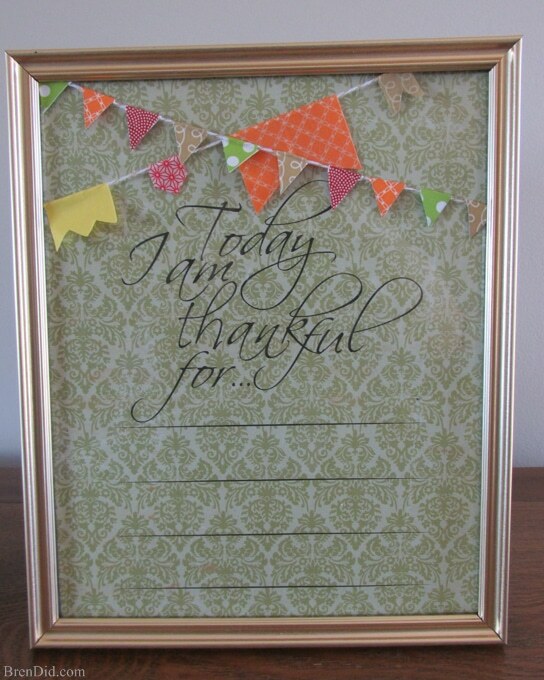 With this idea in mind, I created a printable dry erase board that you can use to trigger discussions and emphasize thankfulness in your kids. We’re using them every day during the holiday season. They’ve already made for some interesting family dinner discussions. 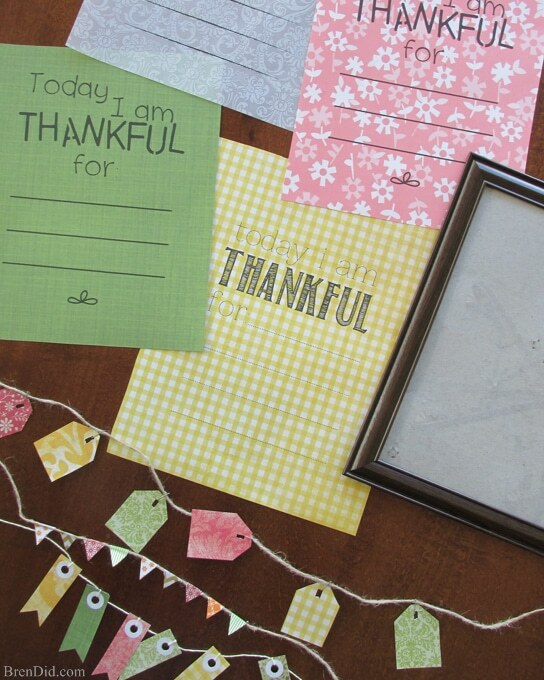 I’ve created free printables that you can use to create “I Am Thankful” boards with your family. It’s a very easy Thanksgiving craft for kids : you print out your favorite design on scrapbook paper or colored paper and insert it into an 8×10 frame. 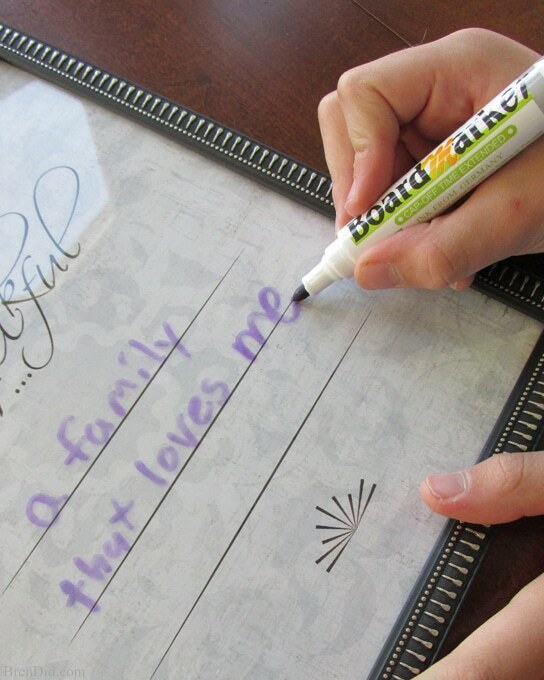 The glass of the frame acts as a dry erase board so you can write a new thought on the boards each day (make sure to use a dry erase marker). Our kids had a great time choosing the perfect scrapbook paper and design for the boards. We used 8×10 frames we had around the house (and a few new ones from Dollar Tree). Then, to make the frames more personal, we used washi tape, twine, and paper to make tiny banners and flags to decorate the edges. Get your favorite design in the free printable library. 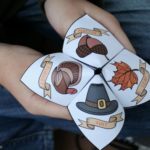 Kids love my Thanksgiving cootie catchers that help them express gratitude. 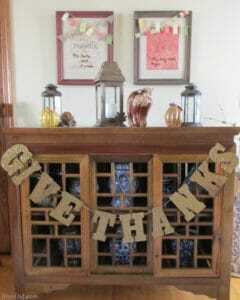 Check out my PBK Inspired Give Thanks Glitter Banner for an easy Thanksgiving craft that looks great hanging with your gratitude boards. 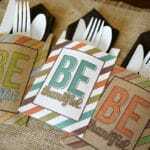 Like my free printables and easy crafts? Sign up for my newsletter below and never miss a thing! Wonderful! I made the Give Thanks banner for this Thanksgiving and now I’m on the hunt for the items for the wishbone napkin rings.I think they’ll work for St. Patrick’s day too. Thanks so much! Thanks, Nancy. I’m so glad you are liking the crafts. If you get a chance you should post a picture of the banner on my Facebook page. I’d love to see the finished product! These are so cute! I love how easy it would be to personalize them too, just by picking the kind of paper that you like! Thnaks Brittany! It is easy to make them different for each person. My kids had fun picking out their favorite papers. What a cutie! I’m so glad you like the boards. Ashleigh, I used Adobe Photoshop (and the rest of the Adobe Suite). It’s a little intimidating at first! Some people use PicMonkey too. What a sweet wife! 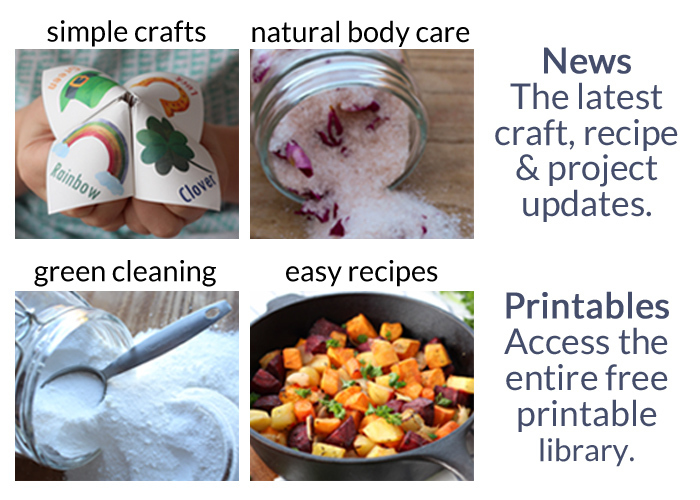 I am so glad you like the printables. You should post a picture on my Facebook page so I can share them. What an absolutely adorable idea! The best part is it is lovely and has a meaningful purpose! Thanks Janelle! I love crafts/activities that connect to kids in deeper ways. 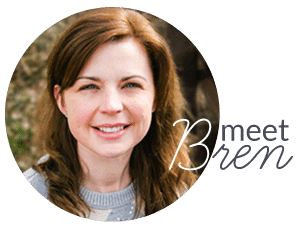 Hi Bren! I’m visiting you from Fellowship Fridays. These are so pretty! 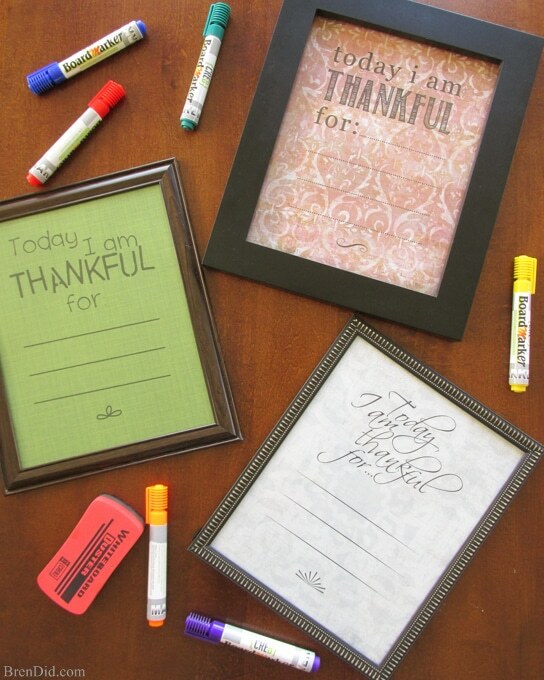 When I read “thankful dry erase board” something else came to m ind, but these are beautiful! I couldn’t agree more that we need to teach and model gratitude for our kids. You’re reminding me to get my Thanksgiving tree up! We fill out leaves every day. I’m so glad you like them! Maybe I need a better title! 🙂 I’d love to see a picture of your Thanksgiving tree, it sounds wonderful! 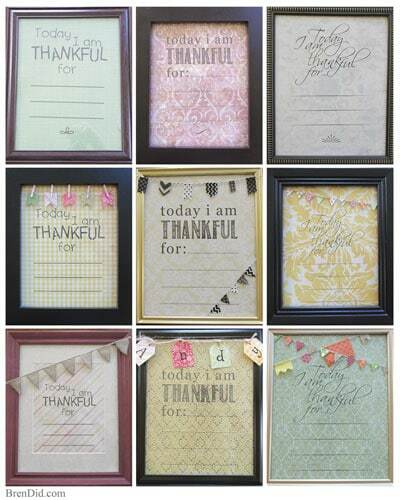 Such a fun way to help kids count their blessings! I’ll be sharing this with my readers on my Facebook page. Thanks Barb! 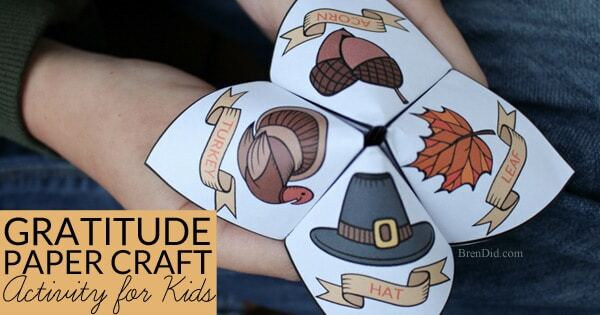 In addition to helping us remember to practice gratitude it turned out to be such a fun and easy craft… and the kids are proud that they made them.